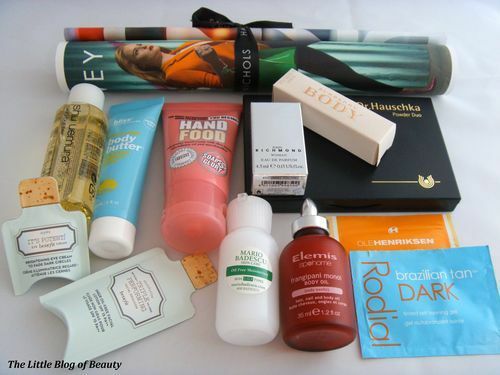 On Saturday 6th April I attended a fashion and beauty bloggers event at Harvey Nichols in Bristol. I didn’t realise that Harvey Nichols have several stores outside of London and I discovered that there is one in Bristol when they followed me on Twitter. 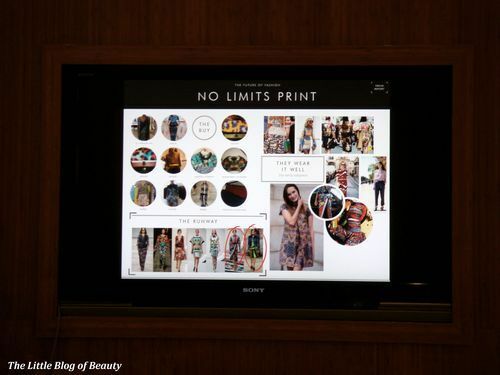 The event was organised by the lovely Nada and included a presentation of fashion trends from their Spring/Summer fashion show and three complimentary beauty treatments for each blogger. The event was held in the personal shopping area and when we arrived we were greeted with champagne (or non-alcoholic options if we preferred). 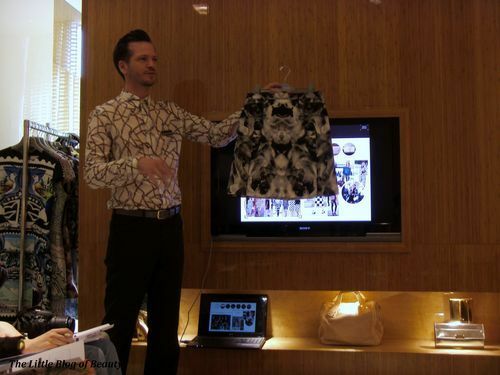 First of all we had a presentation on fashion trends from Daniel Pollock who is the womenswear manager for the store. Apologies for the slightly blurry photo’s but Daniel kept moving! The upcoming trends will include prints, black and white and all white, brights, sheer fabrics, denim, fantasy dresses, foil and laser cut denim. Daniel showed us some gorgeous items including prints based on bank notes and stamps and one city print that sneakily includes a UFO (that apparently many people don’t notice). Next we headed down to the beauty hall for our beauty treatments. 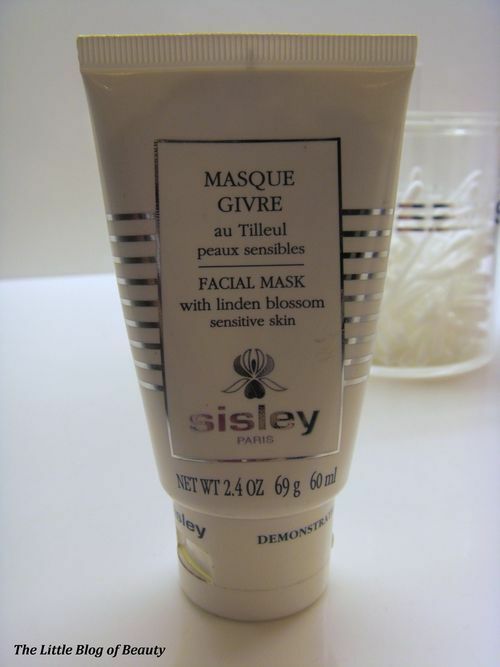 First up for me was a face mask from Sisley. 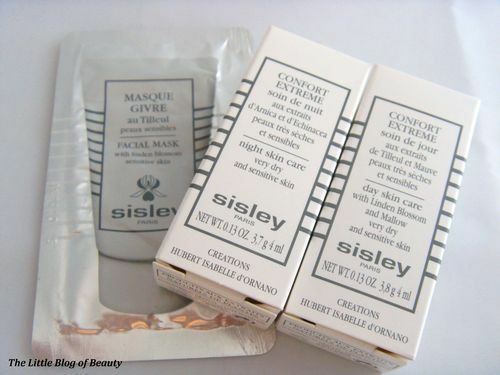 Sisley is a French skincare and makeup brand whose products I haven’t tried before. The lady on the counter took one look at my skin and decided that I have very sensitive skin and so gave me their most sensitive mask to try. Due to the beauty treatments including face masks, facials and make over’s we were advised to wear little or no makeup and I very bravely went without any makeup on. Unfortunately I was having a bad redness day and was also recovering from a breakout, so I’m aware my skin looked awful. I applied the mask and had this on for maybe around five minutes or so but unfortunately even though this was their most sensitive mask I started to react to the mask and the lady advised me to remove it. I was given a couple of samples to take away with me. I don’t think I will use the mask sachet as this is the same mask that I reacted to but I will definitely give the day and night cream a try. Next I headed over to Bliss for a facial. I really should have made a note of the products that were used but didn’t think at the time. To begin with I believe the Bliss Foaming face wash was used which felt really nice and bubbled on my skin. The only other thing I can remember being used was the Pore-Fector gadget which is a little machine that uses sonic vibrations to remove any nasty stuff in your pores. Finally I headed over to Shu Uemura for a makeover. 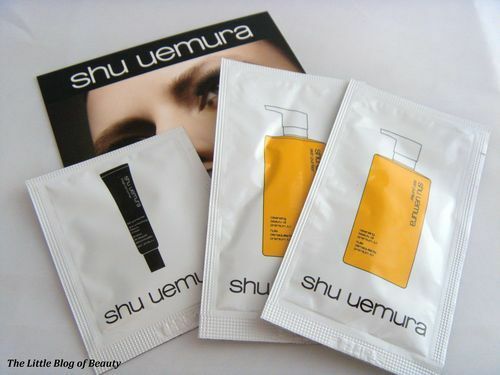 Shu Uemura are a Japanese brand who I have heard of but I haven’t tried any of their products. To begin with the lady demonstrated their lovely cleansing oil (on the back of my hand because of my face reaction) before applying some makeup for me. I’m not particularly good at applying eye makeup myself so we went for statement eyes with subtle cheeks and lips. I was also given a couple of samples to take away including a BB primer and some cleansing oil. 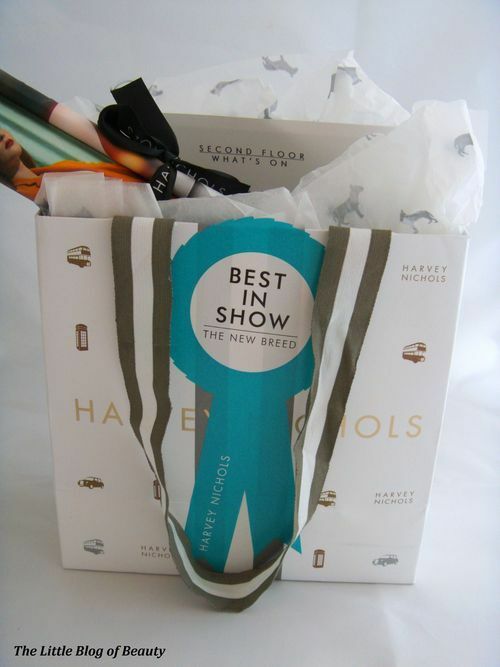 We then headed back up to the personal shopping area where we had a little prize draw where three mystery prizes were given to the lucky winners, and we were all given a goody bag to take away with us. I was excited to see a generous sample of Shu Uemura’s cleansing oil as I really liked the look of this. I’m also looking forward to trying the Bliss Body Butter, Soap & Glory Hand Food and Elemis Body Oil as this will be my first experience of all three brands. The Dr Hauschka compact is a bronzing powder duo which looks gorgeous (and is worth £33!) but may be a bit dark for me as I’m very pale. 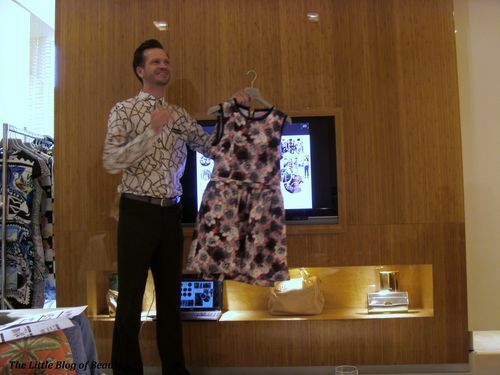 Daniel explained that they want to start encouraging new customers to the store who may not have considering shopping in Harvey Nichols before. I have to admit that I do see Harvey Nichols as a high end department store which stocks designers and brands that I would never be able to afford. However, in terms of the beauty hall although some of the brands are pretty expensive they also stock much more affordable ranges such as Benefit, Bliss, Nails Inc and Soap & Glory. Daniel wants to start appealing to the type of customer that would shop in stores such as Topshop and told us about his plans to change the fittings and displays to reflect this and to introduce some more reasonably priced designers. Thank you to Nada and Daniel for looking after us so well while we were there and if you have a Harvey Nichols near you and have never been in there make sure you go in and take a look around. Oh and while I’m talking about Harvey Nichols did you see their online Christmas Viral advert for 2012? No? Well you can find it here. I’d love if you’d take a look because 1. it’s pretty cool 2. I’m in it and 3. it took nearly 13 hours to shoot!